What causes hybrid batteries to degrade and fail? Cells drift out of balance with each other (voltage delta). The speed of this deterioration is determined by a variety of factors, including vehicle make/model, climate, driving habits, variation in battery cell construction, and more. This battery deterioration means that the individual cells within the battery pack can have a different charge level and capacity - they are no longer 'in sync' with each other. Some cells can be 'full' while other cells in the same battery pack are 'empty'. The overall battery pack performance is limited by the vehicle's battery management system to the weakest cell when discharging and the strongest cell while charging. As a result, the wider the cell imbalance, the narrower the usable range of the hybrid battery becomes. The car's battery management system uses only a limited range of the battery cells actual physical capacity (80%-40% for Toyota and 80%-20% for Honda). As the usable capacity decreases and the cells become further and further out of balance with each other, the vehicle us able to use less and less of the batteries actual capacity. The vehicle cannot correct this imbalance problem on its own. The car cannot force the cells back into balance with each other. If no attention is given to the hybrid battery, it will 'fail' and the check engine light/hybrid battery light will be illuminated. If this happens you are not helpless! It may not be too late. How do I know if my hybrid battery is failing? There are several subtle cues displayed by a hybrid vehicle that can alert you to degrading hybrid battery capacity & performance. If not acted upon, the battery will ultimately display a fault code for battery 'failure'. By paying attention to the warning signs and performing preventative care on the battery before it 'fails', you can easily improve battery health and prolong its life. Hybrid battery reconditioning will improve hybrid battery performance, save you thousands of dollars in avoided replacement hybrid battery costs, and benefit the environment by requiring one less hybrid battery to be manufactured. (Note: The symptoms described below are applicable to Toyota vehicles. Honda vehicles display similar symptoms). The first indication of decreased battery performance is a reduction on fuel economy and diminished vehicle performance. The vehicle does not get the same fuel mileage that it used to and it feels sluggish - lacking in power during acceleration. If equipped, EV mode may be less frequent and for shorter duration then when the vehicle was newer. This happens because as the hybrid battery weakens, the vehicle is forced to use less of the battery and more of the gas engine. It also spends more time charging the hybrid battery in the background (i.e. not shown on the dash). Both of these behaviors reduce fuel economy. This can last for several months as the battery weakens and fuel economy/performance progressively decreases. Note: Sometimes under inflated tires can cause similar symptoms. We recommend checking your tire pressure to be sure that is not the cause of decreased fuel economy. The second warning that your hybrid battery is failing is called negative battery recalibrations. This is initially seen when parking the car for a few days (such as over a weekend) or when parking the vehicle overnight. Just before the vehicle is parked, the dash battery display shows a full or near full hybrid battery. When the car is started the next morning (or a few mornings later) the battery display shows an empty or near empty battery. The empty battery indication can be displayed immediately when the car is started or drop from full to empty in the first few minutes of operating the vehicle. This occurs most often in warmer climates or seasons, but as the battery degrades will happen in any climate. This is a clear sign of a weak battery that needs attention soon. If ignored, the battery will soon progress to the point of failure. If the hybrid battery is serviced before the battery degrades further, the success rate for recovering the pack and restoring it to good operating condition is nearly 100%. 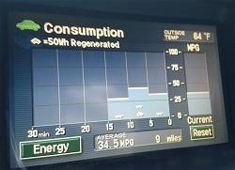 The third and final warning the vehicle displays of a failing hybrid battery is negative recalibrations that occur while the vehicle is being operated. These recalibrations often occurs on warm days or when idling the vehicle for longer periods (such as waiting for a parking spot or railroad crossing), but as the battery weakens can happen at any time. These are seen as the dashboard battery charge display suddenly dropping from near full to near empty. This drop is followed by the gasoline engine revving to a higher than normal idle speed while force charging the battery from empty to full. This event is easily visible on the dashboard battery display and can be audibly heard by the loud, unusual high idling of the gasoline engine. This can be very unsettling behavior as the vehicle seems to ‘take over’ and ignore driver inputs while force re-charging the battery. This is a red flag, serious battery issues are imminent. In these cases, we strongly recommend Hybrid Battery Reconditioning Package to perform a preventative battery reconditioning as soon as possible. Ignoring these symptoms for more than a few weeks will result in the battery displaying a failure code and being stranded on the side of the road. If the hybrid battery is serviced as soon as these symptoms become present, the success rate for recovering the pack and restoring it to good operating condition is nearly 90%. The next phase of battery failure is a failure light on the dash and cell failure. Our products can still help vehicle owners in this situation, but the success rate depends on how long it has been since the failure first appeared. If this describes your car, please give us a call to discuss your specific situation and learn how we can help you and your hybrid vehicle battery. Battery reconditioning is a maintenance process used to increase the usable battery pack capacity and extends its service life. Battery reconditioning is not a one-time event. If performed once and never repeated, the benefits of battery reconditioning will be short lived. Proper battery reconditioning as a recurring maintenance process can significantly extend the service life of the hybrid battery pack. The hybrid battery reconditioning process is performed by first charging & balancing the battery pack with a hybrid battery charger. Then a hybrid battery discharger is connected to the battery to provide load that discharges the battery. The battery is carefully discharged well below the level that the vehicle would allow during normal operation. This deep discharge drains the battery beyond the voltage depression "floor" to break down the memory effect within the cells. As this happens, material is recovered within the cells and the usable capacity increases. After the deep discharge is complete, the hybrid battery charger is reconnected to the battery to charge the cells back to full and rebalance them again. Ideally, this charge -> discharge -> charge process is repeated three times for maximum benefit. Increases in usable battery capacity of 15%-25% or more are common. Battery reconditioning and preventative maintenance balancing is not a onetime event! People who think reconditioning is not a good idea have usually only experienced it as a one time event, not an ongoing maintenance/service of the hybrid battery. A one-time battery reconditioning will typically last 8-15 months and not deliver lasting results. Avoid service centers that claim to restore aged batteries with a one-time battery reconditioning service! Our hybrid battery reconditioning process allows for easy unlimited battery reconditioning for the remaining life of the vehicle. Once the vehicle specific car harness is installed, it enables us to perform Plug-and-Play battery maintenance. Routine battery maintenance can significantly extend the life of your battery. Will a Hybrid Battery Charger and Discharger extend the life of my battery? In a study involving hybrid vehicles that have already received a hybrid battery DTC trouble code before performing the battery reconditioning, 90% of these vehicles report significant improvement when battery reconditioning is performed. With routine reconditioning and regular charging, the DTC light can often be eliminated and battery life significantly extended. Unfortunately, in any one specific case, it is not possible to say for sure how much the charger will help. The amount of improvement depends entirely on the condition of the underlying battery pack. Show me proof. Have any before/after tests? Should a hybrid battery charger be used as preventative maintenance? Better vehicle performance since the re-balanced hybrid battery delivers more assist when accelerating. Higher fuel economy, since the car is spending less time charging the battery in the background. Increased EV function (for equipped vehicles). Recommended frequency of use depends on the age and condition of the battery. If the vehicle is newer and the battery still isn’t performing well, a charge & balance once a year should be adequate. If the battery is degraded and warning lights are on, charging alone will not yield optimal results. It may require cell replacement and performing a full battery reconditioning 2 times per. Call us today for any of your Hybrid vehicle concerns and we will be happy to answer your questions or schedule an appointment.